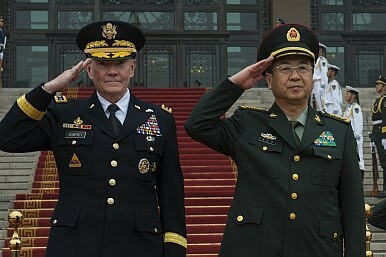 The two members of the Chinese Central Military Commission are reportedly facing disciplinary probes. The Chinese Communist Party (CCP) is scheduled to begin its 19th national congress — called China’s political Game of Thrones by some observers — on October 18. The gathering is widely seen as the most important political event since current Chinese President Xi Jinping came into office in 2012 at the 18th national congress. On September 6, the Chinese People’s Liberation Army (PLA)’s official newspaper, PLA Daily, published a list of 303 military delegates who are going to attend the upcoming congress. Surprisingly to most Chinese domestic readers, but not so to foreign observers, two top generals — General Fang Fenghui (chief of the PLA’s Joint Staff Department) and General Zhang Yang (director of the military Political Work Department) — are not on the list and appear to be excluded from attending the congress. Both generals’ names remain on the Chinese defense ministry’s website and among the 11 members of Chinese Central Military Commission (CMC), the highest party body that oversees the military. Days before the list circulated, there were rumors that several Chinese high-level military officials — including Fang and Zhang — may be facing disciplinary probes. On September 4, quoting three anonymous sources, Reuters reported that Fang is being questioned on suspicion of corruption, although it was unclear if the questioning would lead to a formal indictment. So far, the Chinese government has neither acknowledged nor outright denied the rumors. The newly-released delegation list, however, lends additional support to the rumors. Nonetheless, the ousting of two senior generals is still an unexpected move, as both — Fang in particular — had been quite high-profile in the military for some time. In April, Fang accompanied Xi to Florida and met U.S. President Donald Trump at Trump’s Mar-a-Lago estate. As The Diplomat noted, on August 15, he also met Joseph Dunford, chairman of the U.S. Joint Chiefs of Staff, in Beijing and discussed the North Korean crisis. The meeting was publicly reported at home and abroad. Undoubtedly, the ousting of the two top generals at the tipping point is a critical move made by Xi, who is also the Chairman of CMC, in China’s Game of Thrones.